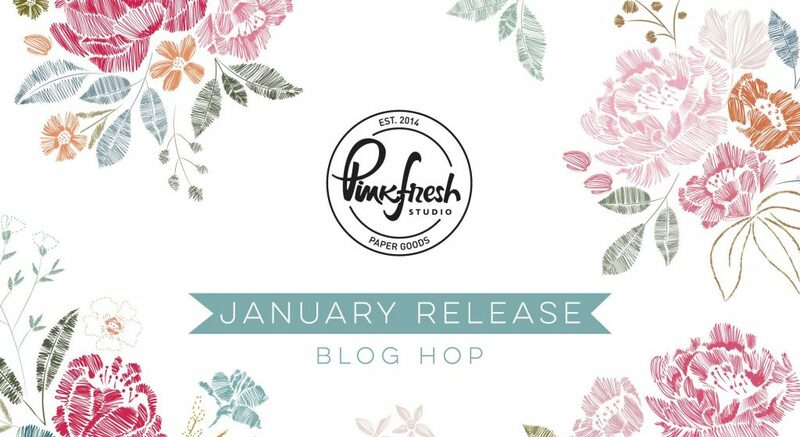 Welcome to the the Pinkfresh Studio January 2019 Release Blog Hop! There are so many products to introduce to you from this release. This is my first blog hop with Pinkfresh studio, I made two cards to celebrate this event. I started by stamping all images from Sweet Lemonade Stamp set on to a piece of 80lbs white card stock. I stamped them extra in a few colors just in case I need to make more cards later. That is my way to save my time and it works like a charm every time. I cut them all with Sweet Lemonade Coordinating dies and set aside. I wanted to keep the background simple but with textures, so I grabbed a piece of A2 sized watercolor paper and cut the sides slight narrow. I attached it onto a A2 sized card base. There are so many trendy water-colored lemonade images out there, so I quickly recreated it by adding some blue watercolor paints on the top of background. Once the background dried, I adhered selected images using liquid glue or foam tapes. At last, I added some clear sparkling sequins to give the card a little shin! Next up is a Floral card using Spring Floral Stand Along Cuts. When you have such a gorgeous die, it is so easy to make a great card. To start my card, I ink blended Tim Holtz Distress oxide ink in Tattered Rose, Worn lipstick and Seedless preserve onto a piece of A2 sized watercolor paper. Then I splattered water over the background and blotted it with paper towel to create the special effect. Then I cut two sets of border die cuts from Spring Floral Stand Along Cuts out of 80lbs white card stock. I attached them around the card base using Multi Medium Matte. 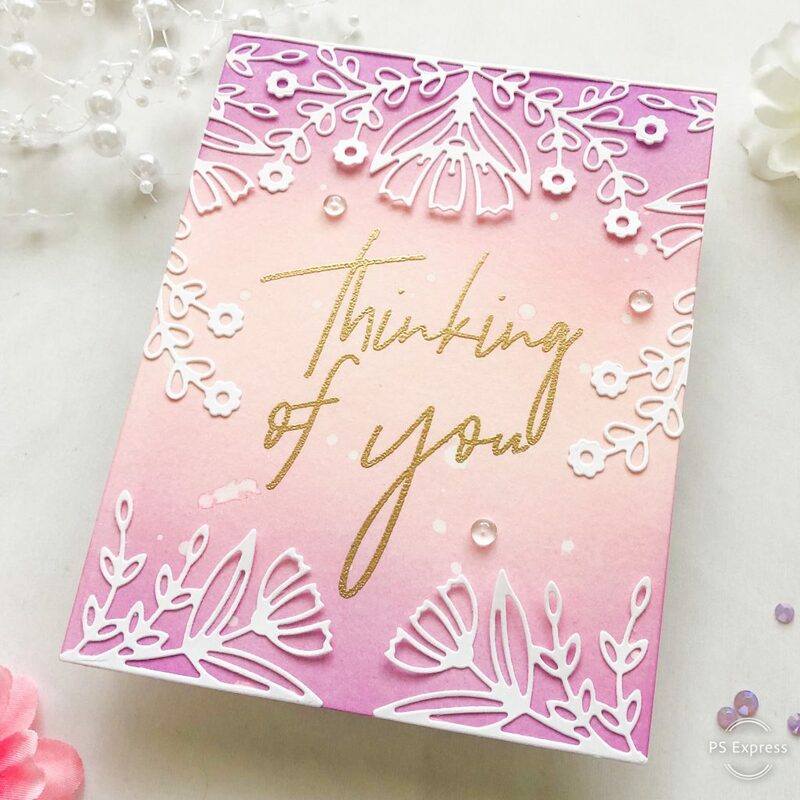 I pulled out the sentiment “thinking of you” from Scripted Bold Sentiment 2 Stamp set, stamp it with versamark clear ink and embossed with metallic gold embossing powder. At last, I added some clear drops to the background as embellishments. 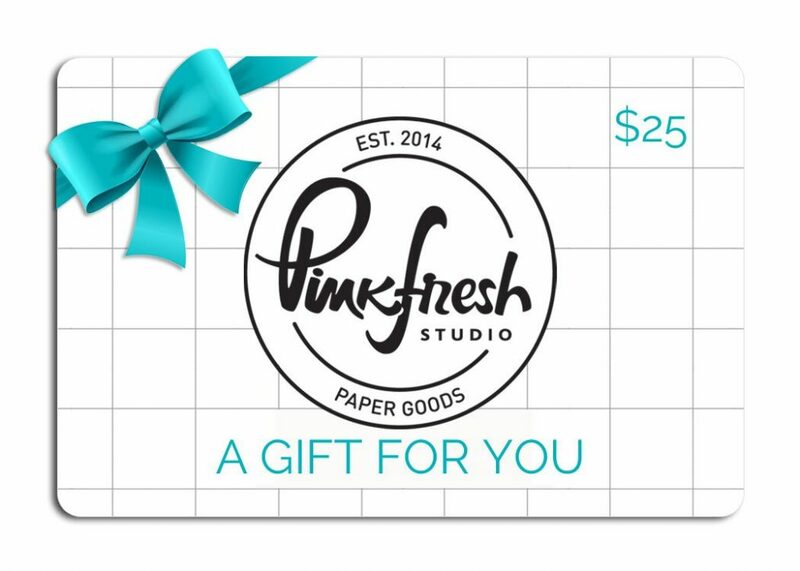 Pinkfresh will be giving away one $25 gift card for my reader for this blog hop. so be sure to comment on each stop! Leave a comment below for your chance to win!The winners will be announced on Sunday, January 20th on Pinkfresh GIVEAWAY PAGE. Please remember to check HERE & claim your prize within 2 weeks. Free die (Dainty Love Balloon) with purchase of $25+. There is no code necessary, and the die will automatically load into your cart once you hit the $25 threshold. Free/discounted shipping from January 14th-17th on orders $50+. You must use the code JANFREESHIPWITH50. Shipping is free in the USA, and $5.50 off for our International friends. Now Let’s Hop to win! 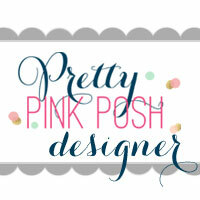 This entry was posted in Cards and tagged Blog Hop, Pinkfresh Studio. I love the Thinking of You card. Love the background and the die. TFS! You are so incredibly talented. Cute cards. I love the saying from the sweet lemonade set. The lemonade card is so delightful!! I love the muted colors!! 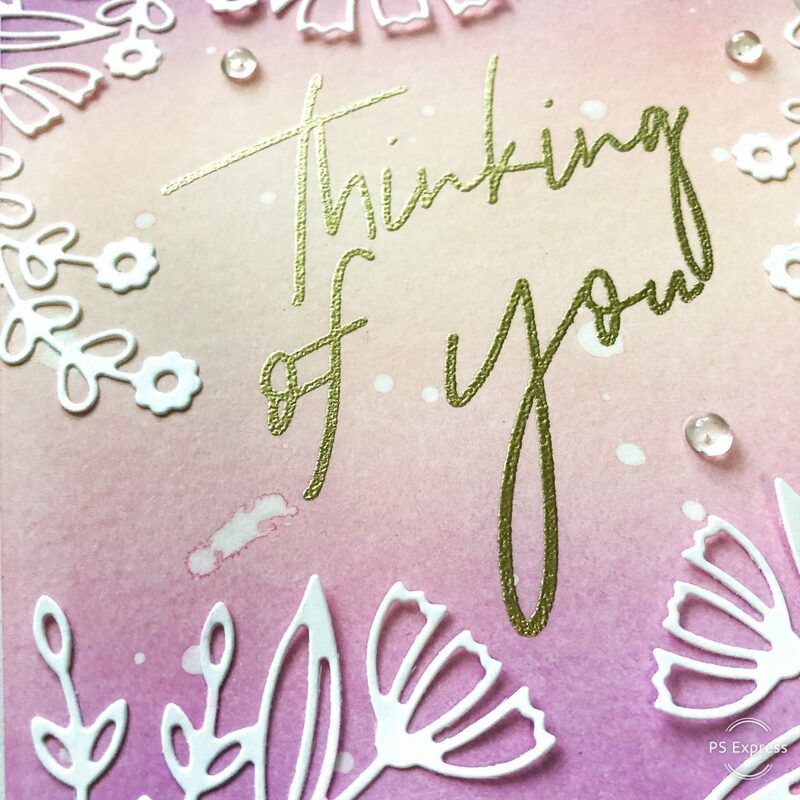 The Thinking of You card is very pretty. The new die is gorgeous!! I love your background. Beautiful colors!! These are lovely and “springy”! I love the soft peachy colors, so sweet! Your cards are simply beautiful! Love the colors on both of them! The lemonade one is refreshing! These cards are ready for spring! I could taste the lemonade now. Lovely cards! Awesome colors and blending. I particularly like the beautiful background you did for the lovely Spring Floral and the fab Scripted Bold Sentiment! These are beautiful cards! I love the colors on the lemonade one!! Beautiful cards~ That sentiment with the lemonade is so fun and perfect. And I love your ink blending! Pretty ink blending and the lemonade card is so fun, great color combo! I really love the new Bold Script Sentiments. I love your card with the Spring Floral die, your ink blending is really beautiful. The first card is so cute; love the sentiment. And the 2nd card is gorgeous with your beautiful ink blending and that perfect die! Beautiful cards. The lemonade card is my favorite. Loved the beautifully blended background in the second card! The thinking of you background colors look amazing. What a great look you achieved. Loving the delicate edges from the die cuts. Fab cards! I really love your flower border card. What a beautiful soft, springy card! It’s gorgeous. The pastel colors you used are so beautiful, love! Great cards. Love the floral die. It’s amazing. Really like the background on your second card it is beautiful. Thanks for sharing your art. It’s freezing over here and your wonderful photos are warming me up! Feels like spring. Wonderful job. super cards – very creative !! OMG that spring floral card stole my heart! Alix, thank you so much for sharing these to beautiful creations. Your use of colors and embellishments add such depth to your project! The lemonade card makes me excited for spring! I can’t wait to try out some of these new products! Thinking of you is my favorite but have younger generation people who would appreciate the leonaide. 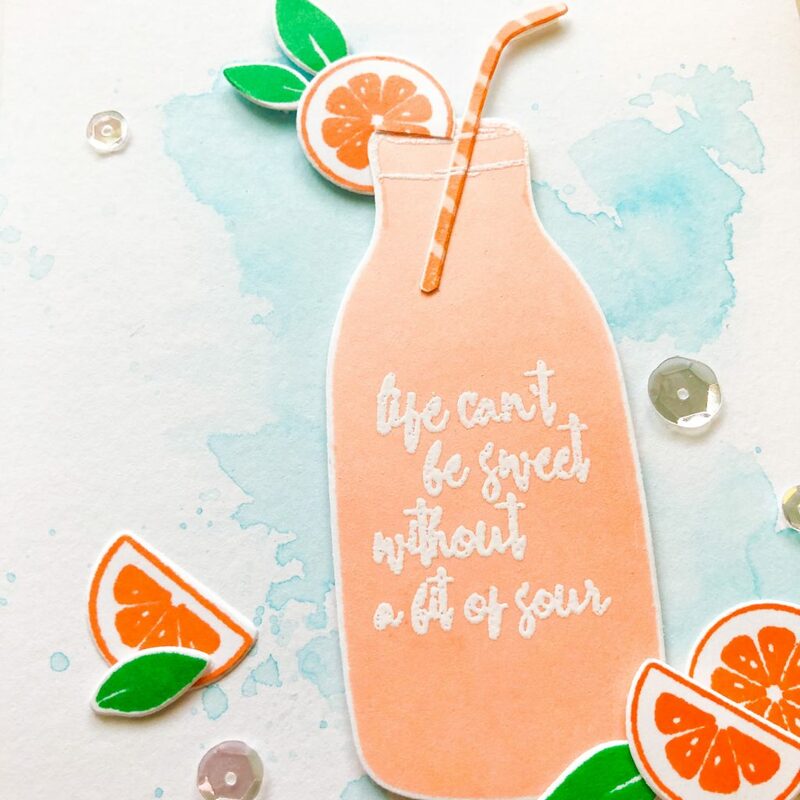 Sweet, fresh and fabulous – gorgeous cards! Great cards; love the peachy cad base and the delicate die cuts. These cards are so beautiful! Especially love the second card. The colours are pretty, the sentiment is very elegant and I love the beautiful, intricate die. I just love both of your cards! I need to try the distress ink combo you used on the 2nd card. So pretty. Your cards are so nicely done! I love the beautiful watercolor background on the first one and the second one is so pretty with the white die cuts. This is sooo fun! I love the backgrounds for both cards and the little sequin accents! Beautiful cards. I love the soft colors. 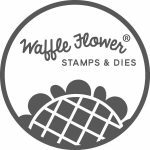 The colors of the spring floral dies is wonderful! And yes the die makes that card beautiful. Gorgeous cards! I love the sweet lemonade card you created!!! And the ink blending and intricate dies are stunning on the second card! Thinking of You is gorgeous. Pretty cards! I love the soft colors you’ve used for the backgrounds. Both cards are just beautiful! I especially love the Spring Floral die! Gorgeous cards!! I love the new sentiments!!! Love the soft orange against the blue water colored background. Makes my mouth water!! The delicate border dies are just beautiful especially paired with the bold yet delicate sentiment! Live your choice of background blends!! Your first card feels like summer! Those script sentiments are gorgeous and I love how you framed the sentiment on your second card. I love your choice of colours in both of them. So pretty. I am not sure if its the DT or the products, but I LOVE LOVE all the cards created each month. And the “free” die with the heart and balloon is amazing! Really nice use of the stand alone sprig die! Beautiful cards! 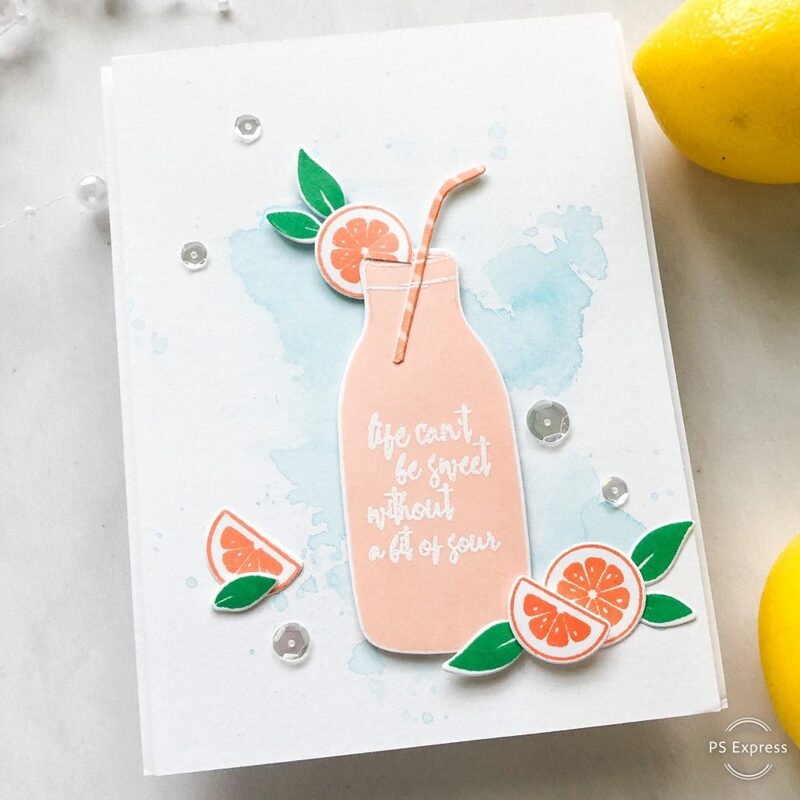 Sweet card with the Sweet Lemonade set! Love the colors! 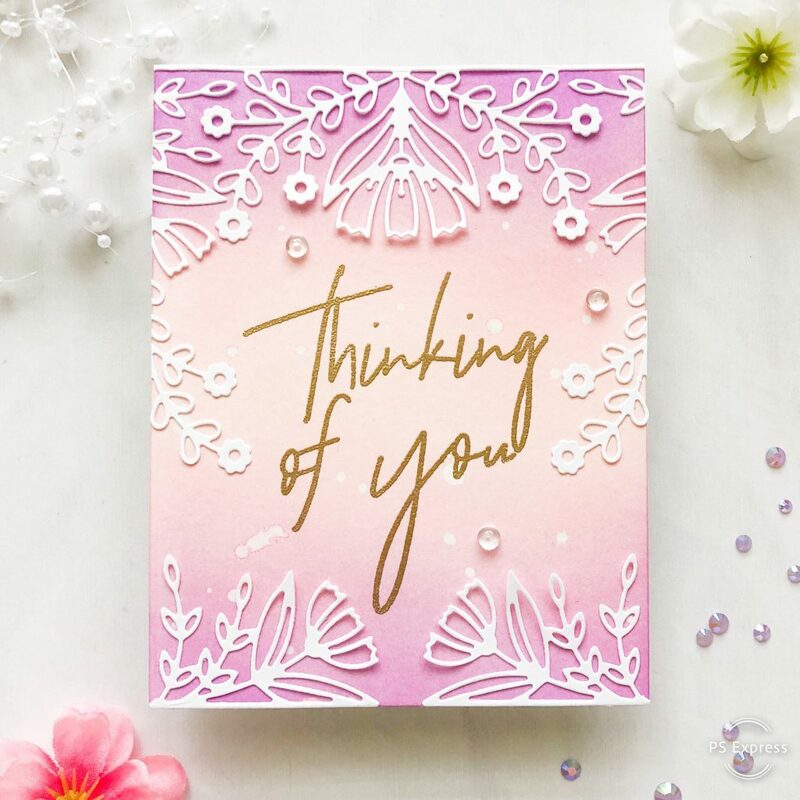 And a beautiful Thinking of You card with those lovely floral diecuts! Oh my word, the Spring Floral is awesome. Love both of your cards. 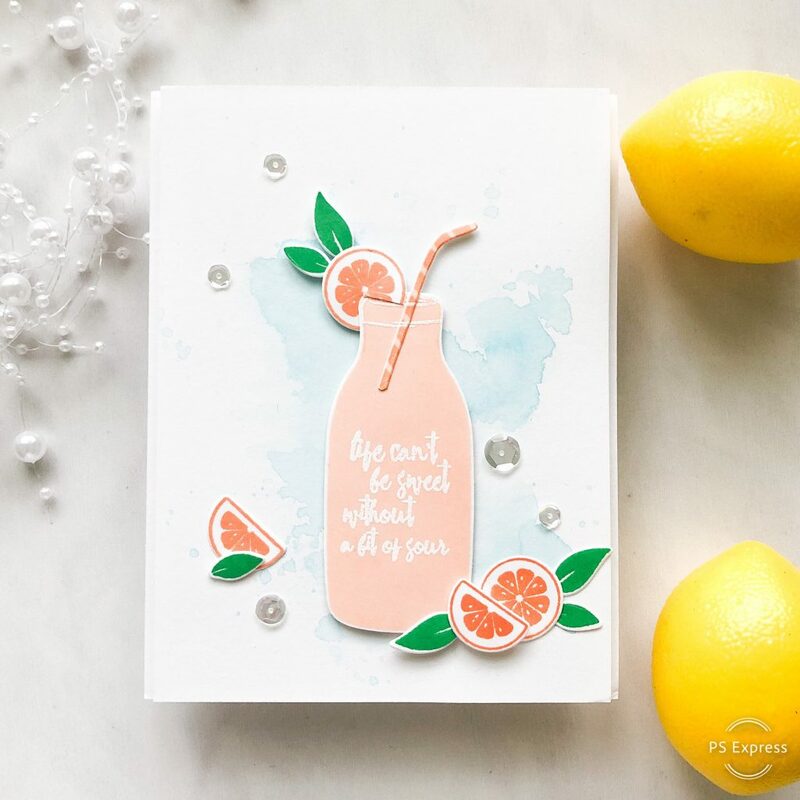 Super fun lemonade card, LOVE it and the pretty ink blended panel is perfect for the delicate and elegant Spring Floral die cut. Love how delicate that 2nd card is. Simply stunning! Beautiful cards! I love the colors you chose in both! I really love your cards and the pretty color blends and palettes you have selected! The pinkish/purplish blend with the white looks really stunning, and very inspiring! Awesome card designs. Just love them. Thanks for sharing! Super fun cards. Love the inky backgrounds with the die cuts. You’ve inspired me! Beautiful work! Lovely cards!! The new release looks amazing! This release is gorgeous as well as your cards are. I love everything about this release!!! Your cards showcase it so well. I love the cheery lemonade card. What gorgeous cards!! The second one is gorgeous and elegant! Beautiful cards! 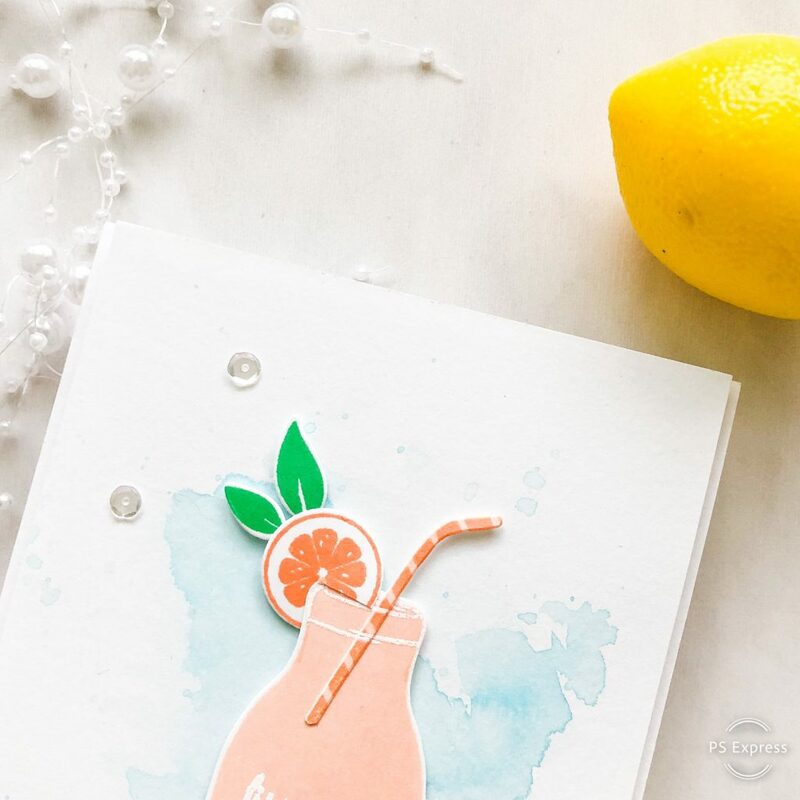 I love the simple blue watercolor background on the lemonade card. I also really like the Scripted Bold sentiment against your awesome background- really pops! A beautiful release!! Love your two lovely cards and the amazing watercolored/ ink blended backgrounds!! Beautiful cards and I love the sour sentiment! So fun. The ink blending is beautiful as well and I love the scripty large font. Great job! Beautiful cards, both of them, but the second one took my breath away! I love that font of the sentiment, too! Oh the bottle set is so much better used on that card I love it. 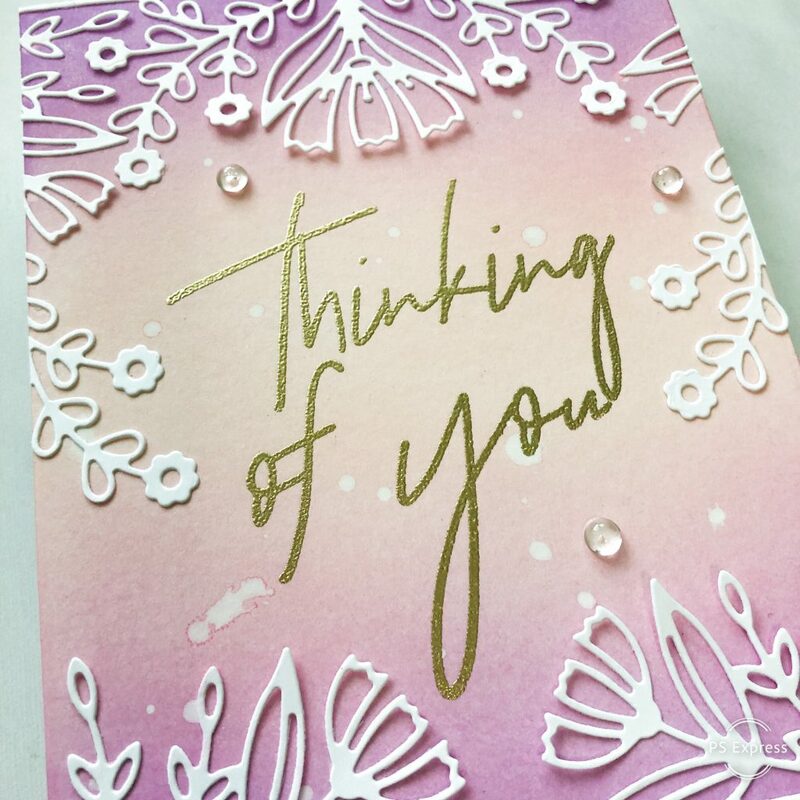 Your “thinking of you” card is very pretty. I like the saying on the lemonade bottle. It is very true. your card makes me wish I was back on the beach with a cold drink! Love both cards, especially Thinking of You! I love your cards, there are fresh and so pretty! That first card just screams summer. Love it! And I really love how you used the dies to frame the card in the second card. Pretty card designs and choice of colors. I really like the soft colors you used on your cards. I think of lemonade, and I tend to think of bright colors, but the peach-y orange is so pretty. And I’m always a fan of that pink/purple combo. Thanks for sharing with us! The Thinking of You card is beautiful. Love your colors. Thanks for sharing. I LOVE the colors you picked ! They look so refreshing and sweet ! Your cards are gorgeous! Love the watercoloring and the ink blending. Perfect with the dies you used! Super cute cards! Love them! You’ve shared two lovely cards that showcase the new products beautifully. I love the soft colors you’ve used!